Spontaneous, irreverent, personal. Collage fits more perfectly into our current age than almost any other artistic technique. The technique of collage fits perfectly into our current age. Raw visual material is collected by an artist and then combined in such a way as to abstract the individual elements enough that the artist’s own vision becomes prominent. 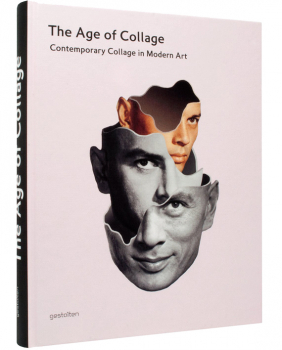 Because collage’s references range from other artistic works and techniques to scientific images, pop culture, and erotica, these raw materials reflect humanity’s collective visual memory and context. It’s collage’s broad scope—and irreverence—that make this technique so interesting for both artist and audience. So it comes as no surprise that a lively scene has developed around contemporary collage in the last few years. Our book cutting edges was the first to document work by this scene, which has continued to expand the possibilities of the genre. Beyond the lowbrow movement, which brings a fresh perspective to figurative surrealism, more and more established artists are now embracing this medium. Their work bridges the historical gap between the classic pioneers of the technique from the 1920s and today’s vanguard of contemporary collage. Showcasing outstanding current artwork and artists, The Age of collage is a striking documentation of this new appetite for destructive construction. The book also takes an insightful behind-the-scenes look at those working with this interdisciplinary and cross-media approach. While illustration, painting, and photography continue to fundamentally influence collage, the featured work also plays with elements of abstraction, constructivism, surrealism, and dada. Collage gives artists more room to stake out diverse artistic positions than almost any other existing technique. Through confident cuts, brushstrokes, mouse clicks, or pasting, collage gives the impossible a tangible form—while turning our worldview on its head along the way. In their visual confrontation with reality in our digital age, which has already made geographic, temporal, and artistic boundaries obsolete, these artists celebrate and exaggerate simultaneousness.